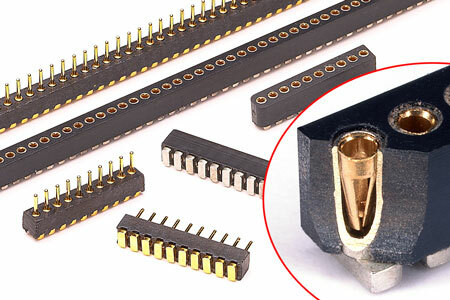 Mill-Max now offers a miniature "self-standing" single row connector pair for surface mount applications. "Self-standing" socket and pin header design minimizes the printed circuit board footprint, i.e. : pad lengths are less than half of those required by traditional "gull wing" connector designs. Available in lengths from 2 to 50 pins. High temp. thermoplastic insulators are suitable for all forms of reflow soldering including "lead-free." Reliable performance is assured through the use of Mill-Max's precision-machined pin and beryllium copper contact technology. Typical applications for this product would be as a board-to-board mezzanine connector in hand-held instruments. It could be used to simplify final assembly or to permit future upgrade of the instrument.